What do we do in our daily lives? Do we care about our actions and do we try to contribute to our society through those actions or by being responsible citizens? Or maybe most of us simply mind our own business not giving a damn about others? Did you ever consider what would you do to prevent a crime? Or, how would you react to a plea for help? This is an important question that does not have easy answers. There is one truth in all of this – no matter whether one’s suit is fancy or cheap, in the end, it’s our actions that make the difference. 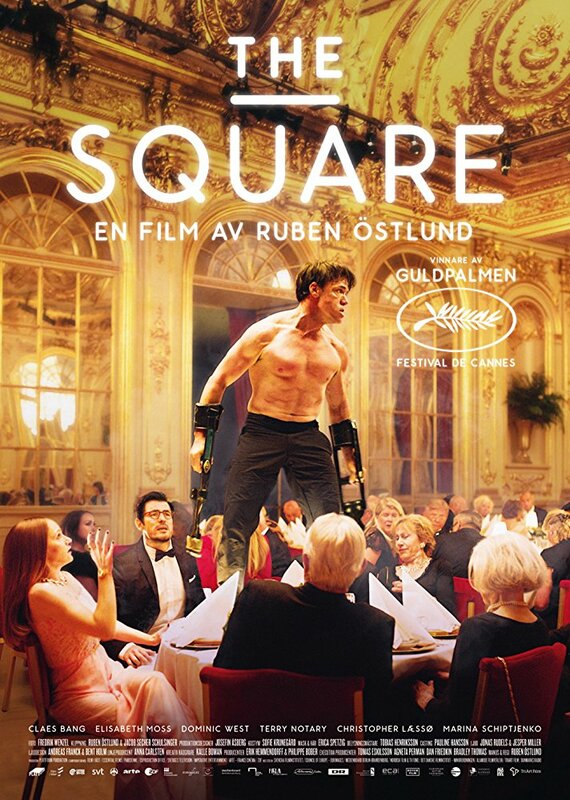 “The Square” by the Swedish director Ruben Östlund well emphasizes this statement, and I feel really thankful for that. “The Square” follows a very respectable curator and public figure Christian (Claes Bang), who works at a museum of contemporary art. He is preparing a new installation at the museum called “The Square”, which is an ambitious and highly anticipated project. However, the PR agency creates quite an unexpected video for the promotion of this installation, which drives the entire project, as well as the reality of the museum and Christian’s life into an existential crisis. This is only one part of Christian’s problems, as in parallel, he is trying to analyze and fix his poor response to the theft incident that has put him in an stupid situation. Seems that every action he takes has its consequences that can lead to a devastating outcome for all parties involved. The film begins with Christian being interviewed by Anne (Elisabeth Moss). Right after this awkward encounter, we find him walking in the streets where he hears a woman’s plea for help. At first, he pays no attention, so do hundreds of other passersby, as if nothing is happening. But the woman walks to Christian, repeating the words: “He will kill me. He will kill me. You must help me.” Christian looks around but does not see anything suspicious. A moment later, a crazy man attacks him, but Christian, together with another passerby, manages to fight back without any violent outcome. Proud of themselves, the two men congratulate one another in the act of heroism, while it seems so obvious that there should be no big deal about helping others. Ostlund’s Cannes film festival 2017 Palm d’Or winner “The Square” is full of unforgettable and shocking scenes. I would like to mention three of them that I find the most prominent. In the first one, Christian is giving a speech in front of the special guests and donors of the museum. He asks the chef to announce the food menu that is going to be served at the reception following his speech, but we see that as the chef starts speaking, the guests start leaving the hall, showing no interest in someone whom they consider less important. The chef is forced to yell to draw everybody’s attention back to what he is saying. I believe this is a scene that will provoke long debates among film lovers. The second scene is when Christian, entering a bistro, encounters a homeless woman. She has no money to buy food for herself and demands that Christian buys a meal for her, specifying that there should be no onion in it. Speechless, he fulfills her demand but instead of thanking him, she complains about the way he handed her the meal, using offensive language. The third, and the most important scene is that same video made by the PR agency that causes chaos for the museum. A little girl slowly approaches the square, meanwhile, the credits on the screen ask people whether they are compassionate to the little girl and if they knew there was a threat and she might die, what would they do to prevent it. The video is not aimed to show the best in people but to unfold the ugly, dark sides, that won’t surprise anyone anymore. In conclusion, I should mention Ruben Östlund’s previous feature film – “Force Majeure”. It is quite an eye-opener, where we watch a man trying to escape an avalanche while leaving his wife and children behind. While the subject tackled in “Force Majeure” is complicated and thought-provoking, “The Square” goes much beyond that – analyzing and examining the humanity overall and why is it important for each of us to be a responsible part of the society. And it equally applies to those who have million dollars in their bank account and those who do not. The film is a brilliant, nail-biting social satire, where we are given a chance to see ourselves from the distance.